The 1979 Kawasaki Enduro KL 250 For Sale has no problems or leaks and has a new battery, a new clutch, new tires and a -clear title (in hand). 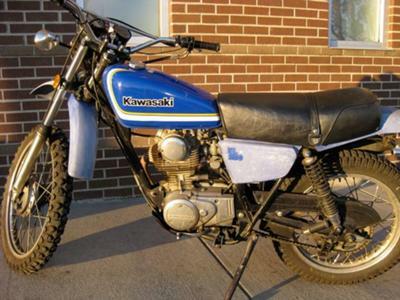 The used 1979 Kawasaki Enduro 250 is in FANTASTIC SHAPE & READY TO RIDE! You can look but YOU WON'T FIND ONE IN BETTER SHAPE. I rode the Kawasaki all spring, summer & fall both in the city and off road as it goes everywhere. It starts after one or two kicks and you're ready to go! into the bike to get into the the shape that it's in. You're going to see that this bike rips and runs like crazy for a 250. It's super fuel efficient. You can fill up the gas tank and ride it for 3 weeks as it gets at least 50mpg and that's a lot of fun for a cheap price. One more thing that I would like to call to your attention is that the Kawasaki Enduro's fuel tank has old school Bronco blue paint....YEAH! I also have more pics of the 1979 Kawasaki Enduro KL 250 For Sale if you are seriously interested. Contact me with questions using the comments form located directly below this ad (including your contact information) provided by GoGoCycles Used Motorcycles for Sale and I will get back with you as soon as possible. GoGoCycles would also encourage bikers to submit a review of the a href="https://www.gogocycles.com/kawasaki-dirt-bike.html">1979 Kawasaki Enduro KL 250 For Sale to help potential buyers make informed decisions and to benefit the biker community as a whole. The first guy that shows up with my price of $1650 rides this classic away and SUMMER IS ALMOST HERE!